Geeks, nerds, dorks — chances are, you didn’t attend your high school prom. During college, you were so focused on your engineering/math/science degree that other humans barely registered within your domain space. This is your chance to rectify your oversight without yielding to irrational forces of social pressure, and perhaps enrich your symbolic-semantic inter-nodal linkages, as well! 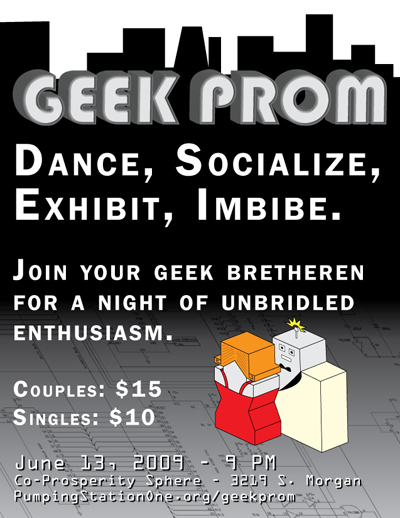 (okay, that was actually gibberish) On June 13th come to Pumping Station One‘s grand opening event, the Geek Prom! Tickets are available in advance at $15 for a couple and $10 single through Eventbrite. Further details including entertainment and sponsors can be found here as they develop.